The plushest, most ostentatious and dramatic of all the Leovilles in 2000, this wine is already sumptuous, displaying some nuances in its huge nose of vanilla bean, black chocolate, jammy black cherries, cassis, and graphite in a flamboyant style. Opulent, savory, rich, and full-bodied, it is a head-turning, prodigious wine and a complete contrast to the extracted behemoth of Leoville Barton and the backward, classic Leoville Las Cases. The Poyferre’s low acidity, sweet tannin and an already gorgeous mouthfeel make it a wine to drink now as well as over the next 25 or more years. The Wine Advocate - The plushest, most ostentatious and dramatic of all the Leovilles in 2000, this wine is already sumptuous, displaying some nuances in its huge nose of vanilla bean, black chocolate, jammy black cherries, cassis, and graphite in a flamboyant style. Opulent, savory, rich, and full-bodied, it is a head-turning, prodigious wine and a complete contrast to the extracted behemoth of Leoville Barton and the backward, classic Leoville Las Cases. The Poyferres low acidity, sweet tannin and an already gorgeous mouthfeel make it a wine to drink now as well as over the next 25 or more years. Jancis - Mid crimson with a bit of evolution. Fragrant. Much less concentrated than the Barton but an attractive expression of the vintage and appellation. Dry overall and quite sinewy. You could start to drink this even though it is far from its apogee. Parker - The plushest, most ostentatious and dramatic of all the Leovilles in 2000, this wine is already sumptuous, displaying some nuances in its huge nose of vanilla bean, black chocolate, jammy black cherries, cassis, and graphite in a flamboyant style. Opulent, savory, rich, and full-bodied, it is a head-turning, prodigious wine and a complete contrast to the extracted behemoth of Leoville Barton and the backward, classic Leoville Las Cases. The Poyferre’s low acidity, sweet tannin and an already gorgeous mouthfeel make it a wine to drink now as well as over the next 25 or more years. 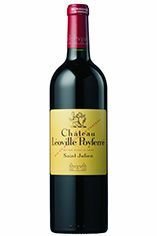 Château Léoville Poyferré was the Léoville that got left in the starting blocks in terms of reputation and in the quality of its wines. Léoville Poyferré has been owned by the Cuvelier family (who also own Château Le Crock) since 1921, yet it was not until the 1970s, when Didier Cuvelier took control at the château, that quality began to improve. In the last 20 years, Didier, with the assistance of Michel Rolland since 1995, has turned Léoville-Poyferré into one of St-Julien's finest estates. Léoville Poyferré has 80 hectares of vineyards planted with Cabernet Sauvignon (65%), Merlot (25%), Petit Verdot (8%) and Cabernet Franc (2%). Léoville Poyferré traditionally produced the softest and most supple wine of the 3 Léovilles, yet in the last decade the wines have definitely put on weight and body. This is largely due to the grapes being harvested riper and later and because of the increased exposure to new oak in the maturation process. Now up with the best of the St-Juliens but still selling at non-scary prices. Léoville Poyferré is classified as a 2ème Cru Classé. St Julien is the smallest of the "Big Four" Médoc communes. Although, without any First Growths, St Julien is recognised to be the most consistent of the main communes, with several châteaux turning out impressive wines year after year. 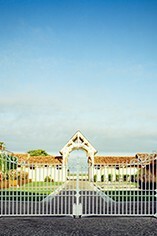 St Julien itself is much more of a village than Pauillac and almost all of the notable properties lie to its south. Its most northerly château is Ch. Léoville Las Cases (whose vineyards actually adjoin those of Latour in Pauillac) but, further south, suitable vineyard land gives way to arable farming and livestock until the Margaux appellation is reached. The soil is gravelly and finer than that of Pauillac, and without the iron content which gives Pauillac its stature. The homogeneous soils in the vineyards (which extend over a relatively small area of just over 700 hectares) give the commune a unified character. The wines can be assessed as much by texture as flavour, and there is a sleek, wholesome character to the best. Elegance, harmony and perfect balance and weight, with hints of cassis and cedar, are what epitomise classic St Julien wines. At their very best they combine Margaux’s elegance and refinement with Pauillac’s power and substance. Ch. Léoville Las Cases produces arguably the most sought-after St Julien, and in any reassessment of the 1855 Classification it would almost certainly warrant being elevated to First Growth status.